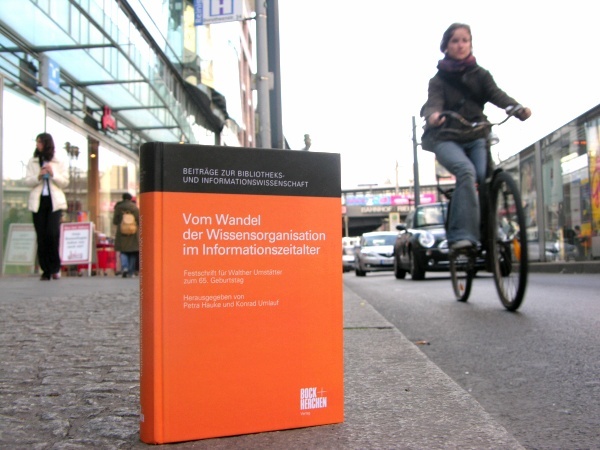 Celebrating Transformation: A Review of the Festschrift for Walther Umstätter. Michael Seadle, "Celebrating Transformation: A Review of the Festschrift for Walther Umstätter. A Festschrift is a peculiarly academic method for celebrating a birthday. Instead of balloons, noisemakers, cake and coffee, the academic world invites students and colleagues to assemble the intellectual elements of a person’s career. A Festschrift is particularly valuable to an anthropologist of academic culture, because it encompasses the range of human interactions that, at least at one fleeting moment, intersected the life of the object of the Festschrift. Walther Umstätter directed the Institute for ”Library Science” through its transformation into the Institute for “Library and Information Science” and many of the articles come from colleagues. These articles give a sense of the intellectual context in which he worked and in which Germany’s only university-based library school began the process of reinventing itself to compete with the influential American iSchools. While these articles offer valuable insights, those by current and former students are particularly interesting because they represent the Institute’s intellectual end products. This review will concentrate on the latter. The Festschrift includes seven articles by former students from the masters or doctoral program: Olaf Eigenbrodt, Martin Fenske, Simone Fühles-Ubach, Christine Gohsmann, Ben Kaden, Philipp Mayr and Dieter Schwartz and the topics show a particularly strong engagement with cutting edge concepts from digital libraries to issues involving the semantic web. This shows the extent to which the Institute’s transformation into a genuine iSchool took off during Umstätter’s leadership. This is indeed one of the key intellectual issues facing library science as a scholarly discipline. Distinctive, highly developed research methods characterize scholarship in the modern world, and any field that merely borrows methods promiscuously risks epithets about its intellectual rigor. Librarianship has no Ranke, no Weber, no Levi-Strauss to define how we approach the problems of our world. If we are not to be a mere trade school, we must take Kaden’s warning seriously. Many professional schools in the US have struggled to address this problem too. In US business schools, the solution has been to draw heavily on a few key disciplines with obvious relevance, such as economics and psychology, and to train students and future faculty to use their methods with indisputable rigor in pursuit of issues relevant to a particular profession. This approach also characterizes the School of Information at the University of Michigan, whose required introductory curriculum offers an intense excursion into social science methodologies with significant doses of psychology and economics. During the negotiations for my professorship a number of colleagues spoke about developing a unique Humboldt-school of thought. Kaden and others of his generation may achieve this, given the right tools and support. They understand the syntax of the digital world with the ease of a native speaker. In the meantime a judicious borrowing of disciplinary methods on the model of US business schools may provide an infrastructure on which they can build. The question is: which disciplines? Library science needs to adopt methodologies that can address the language problems inherent in the construction of a thesaurus, as well as the social dimensions of the construction and the use of the tool itself. Linguistics has obvious relevance, but it does not address the full range of Eigenbrodt’s triangle between person, environment, and politics. Anthropology does both. As Nardi and O’Day say, “metaphors matter” and to understand this Festschrift as a whole, their metaphor is helpful. The key word in the title is “Wandel” and, in some sense the changing intellectual ecology for pre-Library 2.0 fauna has favored certain species who adapt easily to the new environment. For some Festschrift authors, technology is a mere external tool to be used or not as preference and circumstances dictate. For others it is integral to their social and working environment. It would not be hard to sort the articles by those authors who love the change and those who are doing their best to cope with it. Walter Umstätter had the vision to lead the Institute into an environment where it has a future. That leadership is, in the end, what this Festschrift celebrates. Michael Seadle ist geschäftsführender Direktor des Instituts für Bibliotheks- und Informationswissenschaft und hat den Lehrstuhl für „Digitale Bibliotheken“ inne, die die Forschungsgebiete, Evaluierung Digitaler Bibliotheken und Urheberrecht. Er ist Herausgeber der bibliothekswissenschaftlichen Zeitschrift Library Hi Tech.